That’s why EDF is working with small-scale fishers and communities to implement fisheries management programs that rewards sustainable fishing practices. Through our Fish Forever partnership with Rare and the University of California Santa Barbara (UCSB), we’re empowering fishing communities in the developing tropics to manage their near-shore fisheries with a proven, sustainable management approach called TURF-reserves. Territorial Use Rights for Fishing, or “TURFs,” are fishery management systems in which fishers and/or communities have a secure, exclusive privilege to fish in a defined area. In exchange, the community and fishers help develop fishery plans and manage the area. By assigning fishing rights to a designated group, fishers are empowered to take responsibility for the future of their TURF and directly benefit from their conservation-minded fishing practices. Well-designed TURFs empower fishers and coastal communities, providing them with the opportunity to take part in the management of their fishery while also increasing food security, improving livelihoods, strengthening communities and conserving marine habitats. When TURFs are paired with no-take reserves, creating “TURF-reserves”, the two complement each other to create sustainable fishery management and protected areas. 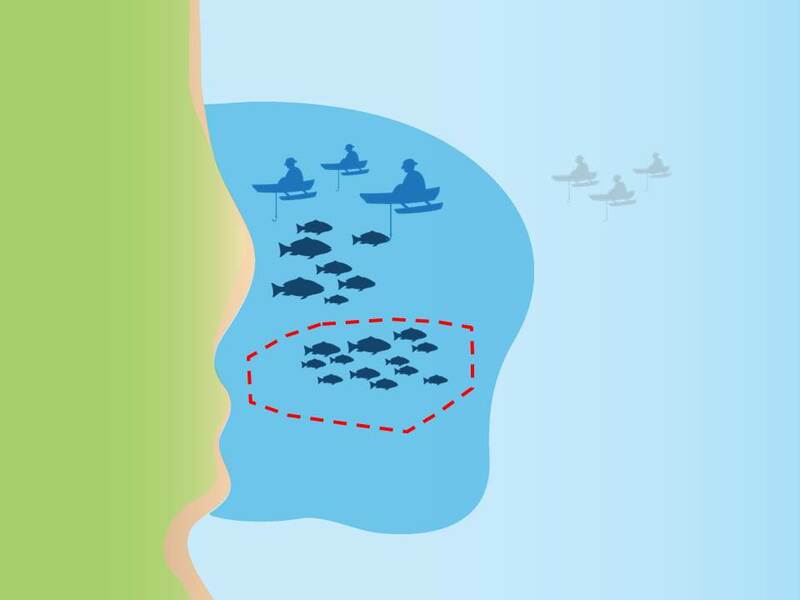 As marine resource populations recover and thrive in reserves, fishers directly benefit from the spillover, rather than having to compete in an open access fishery. This creates stronger incentives to prevent fishing in the reserve and sustainably harvest in the TURF. Conversely, without managing harvest inside TURFs and the surrounding waters to the reserve, marine resource populations won’t have the opportunity to rebound and benefit fishers. A TURF-Reserve. The TURF is dark blue, the reserve is inside the dotted red line. Over the past year, EDF staff has worked with Master’s students from the Bren School of Environmental Science & Management at UCSB to create TURFtools, a tool and resource to be used at Fish Forever sites to facilitate TURF-Reserve design decisions. TURFtools incorporates both local fishing knowledge and the best available scientific data to provide communities with information on the economic and biological tradeoffs of different design options. TURFtools helps communities compare and contrast different design options based on their environmental and socio-economic goals. 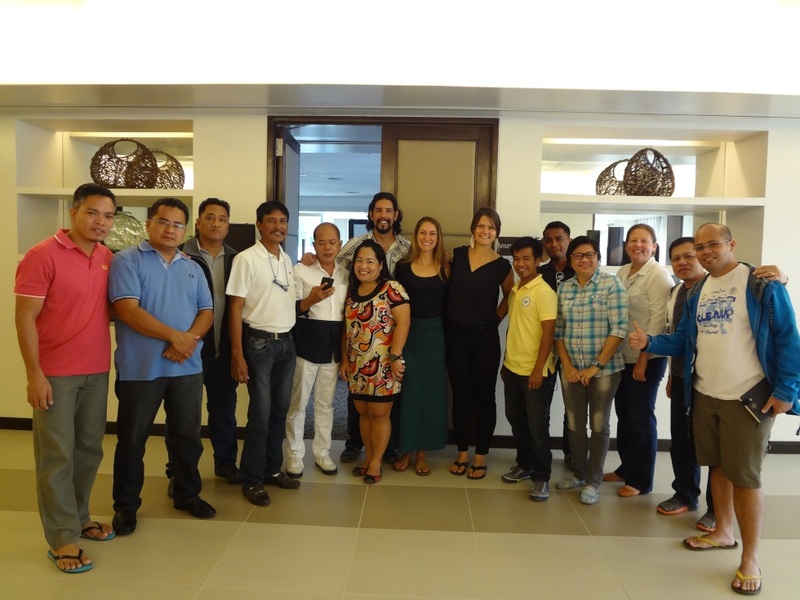 While the students piloted the tool in the Philippines, TURFtools can be customized to any type of fishery in any location and will be used across the Fish Forever countries. EDF is fortunate to have worked with such a bright and passionate group of students to develop this very important tool. As we continue our Fish Forever work to improve the sustainability of small-scale fisheries, we will incorporate lessons learned from the field in order to improve and build on TURFtools. To learn more about the tool, visit: http://www2.bren.ucsb.edu/~turftools/. This entry was posted in Fish Forever project, Global Fisheries, International and tagged fisheries training, fishing communities, small scale fisheries, tools, TURF Reserves, TURFs. Bookmark the permalink. Both comments and trackbacks are currently closed.